I have 3 special men in my life who are celebrating their birthdays this month so I thought I would share a little series of masculine birthday cards. This first one is for my dad, who is turning 83 today! I wanted to create a fun card, but also express how much I think of my dad as a superhero. Then I fussy cut him out and inked the edges of the cut images with a Tuxedo Black Momento Marker (this inking detail really gives a clean finished look). For the shaker window, I used the Pretty Pink Posh Peek A Boo Die and curled open the flaps and glued down just the tips to give a nice dimensional look. I backed the opening with a scrap of plastic sheeting from a Project Life pocket and glued that down with Glossy Accents (this is great for non-porous materials like plastic). I probably should have stamped the sentiment before opening up the peek a boo die cut area, but using a MISTI tool, I was able to do it afterwards and just double stamp it to get a crisp stamping. 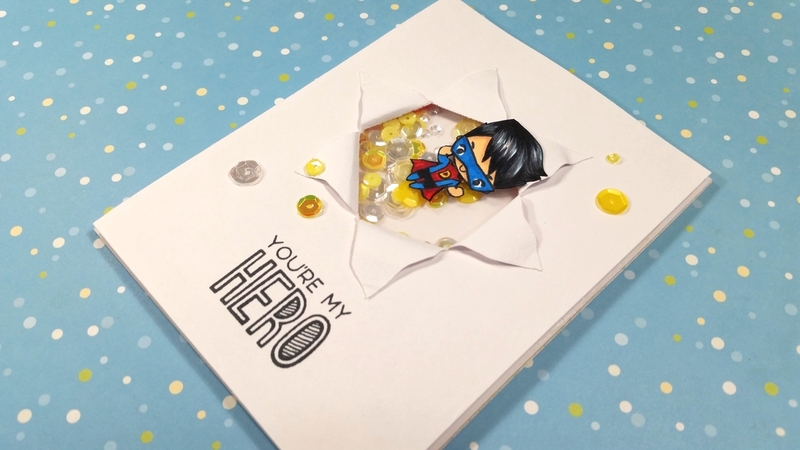 I used the “You’re My Hero” sentiment from the Little Hero stamp set. 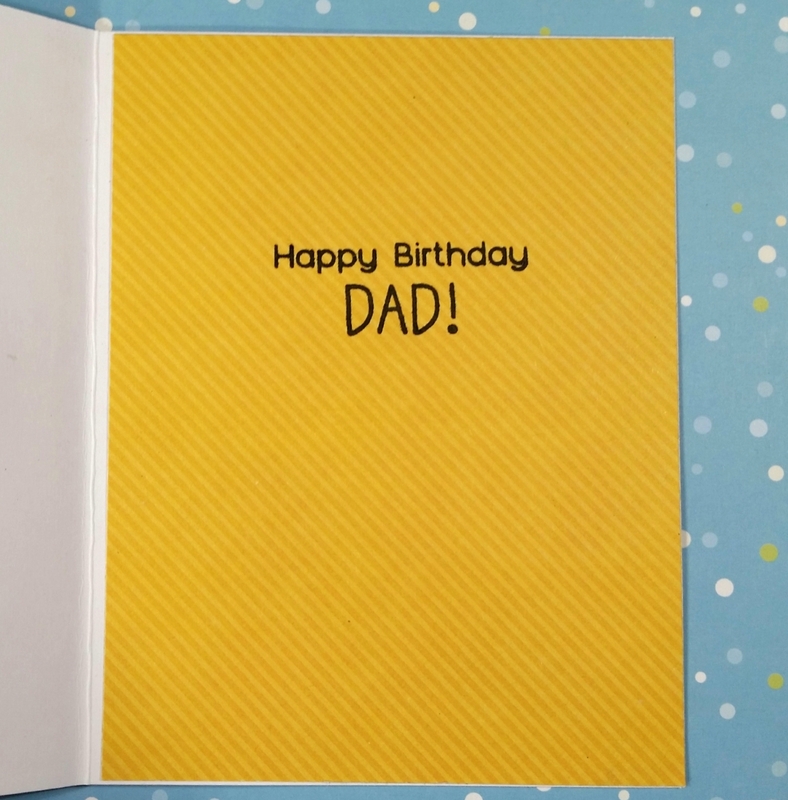 I also took a piece of yellow striped scrap paper from my scrap box and used the “Happy Birthday DAD!” sentiment from The Greeting Farm “I Love Dad” stamp set for the inside liner. Now to complete the card front, I lined the back side of this card front with double sided foam adhesive (2 layers for added depth) and brushed the edges of the peek a boo die opening area with my embossing tool to eliminate the stickiness on the sides of the foam tape so the shaker sequins wouldn’t stick to the edges of the foam tape. Next I added sequins from the Simon Says Stamp Sunshine Mix (I love the variety of cheery shades and sizes in this mix — it’s like a burst of sunshine!) into the peek a boo well. Finally I placed the card base onto the card front, being careful not to knock the sequins out of the well. That is adorable! What a cute little guy. Super fun card, love the shaker element! Thanks so much for playing along at Penny Black and More! Thanks so much Ellie! It was a fun card to make for my pop! What a super fun card. Thanks so much for sharing your art with us. It’s always a treat to have you play along, and I hope you’ll join us again soon. P.S. I’d love to have you stop by my blog to say hello. Thank you so very much for your kind words, Karen! A super masculine creation and such a nice design as well, many thanks for joining our For the Boys theme at penny Black and More challenge. Thanks so much Brenda! Your challenge was perfect for all the masculine birthday cards I have to make right now! What a cute card! 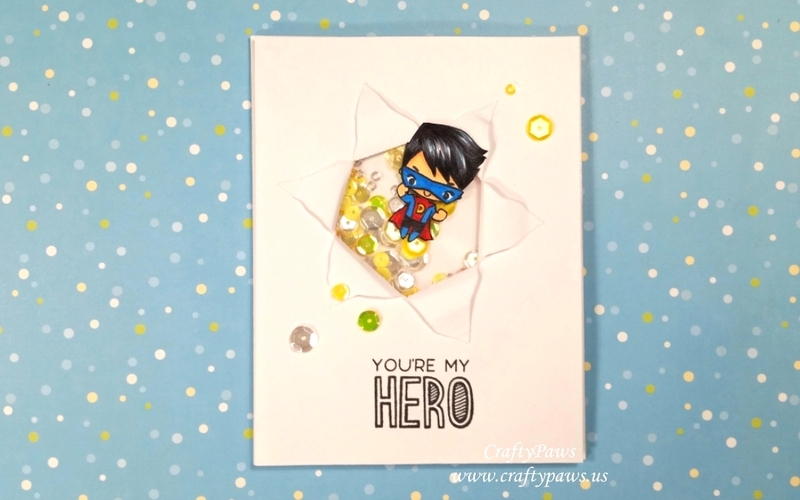 Love the hole in the center with sequins and this super hero! Thank you for joining our Red/White/Blue SSS Monday Challenge! Terrific card!! I love how you did it. Your dad will absolutely love it. Happy birthday to the men in your life! I think that they’re all cancerians, me too! YAY! Awww thanks so much! Happy birthday to you too! Fabulous shaker card. I love the way you have the character bursting out of the card. Thank-you for joining us at the Crafts Galore Encore Challenge ‘Anything Goes’ July 2017. Awww thanks so much Nicola! WOW thanks so much Nicola! Thanks for taking the time to leave a sweet comment! Thank you soo much for taking part in our “anything goes with optional red, white & blue” challenge over at Creatalicious & good luck in the draw. You’re so sweet! Thanks for the lovely comment!